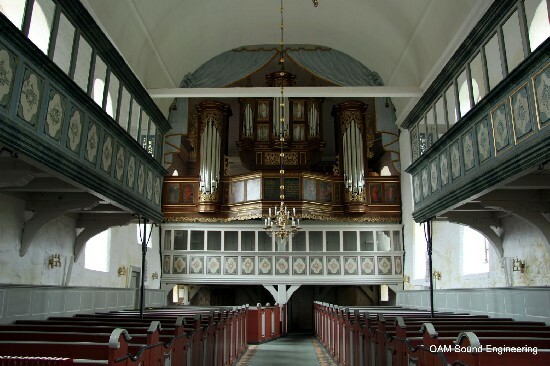 Description: In 1685 Arp Schnitger was commissioned to build a new organ on the west gallery. Schnitger realised an instrument with a Hauptwerk, a Brustwerk and a Pedal division in two independent cases totalling 28 stops, of which six incorporated pipework from the 16th century. The organ was completed in 1687. The various individual stops have great tonal beauty and polyphonic quality while the Principals, flutes and reeds blend together incredibly well offering a stunning sonority, even with a limited number of stops. The instrument has an extraordinary high number of original pipes with original voicing. During the restoration it was decided to tune the organ to a mild non-equal temperament as probably already applied by Georg Wilhelm Wilhelmy in 1775. The instrument was already well-known in the 1950s by LP recordings and was repaired by organ builder von Beckerath at that time with great respect. Schnitger Steinkirchen was the starting point of a reawakened interest in historic organs and their restoration. Since the restoration in 2012 by Rowan West, the instrument is considered to be one of the most authentic Schnitger organs in existence and still in its original position.